Much has been made of the MacBook Air's completely sealed case, meaning you can't simply pop in a new battery when you're out of juice and on the road. 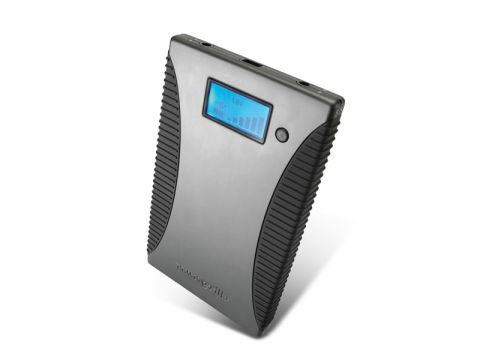 The Powergorilla offers a solution – it's a tough and portable laptop battery charger. Once you've charged it up you can get pretty much a full charge on your MacBook Air out of it. There's also a USB port that enables you to charge your iPod and iPhone (we tested it with a variety of iPods, and they all charged happily). Annoyingly, while it comes with all sorts of leads in the box, for every type of PC laptop and mobile phone under the sun, it doesn't come with Apple's MagSafe adaptor. To get it to work with your MacBook Air you need to buy Apple's MagSafe Airline Adapter (£29), and plug that into the car charger adaptor that comes in the box. It's a convoluted process, but it does work. The Powergorilla also charges the MacBook Pro, but you'd be better off buying a second battery for £99 from Apple.